1. Preheat oven to 350 degrees. Part-roast the halved peppers for 7 minutes on a parchment lined sheet. 2. While the peppers are roasting, heat a sauté pan over medium heat, heat 2 teaspoons of oil and brown the sausage. 3. While the sausage is browning, heat the remaining olive oil in a second pan over a medium high flame and sauté onion and pepper until tender and translucent. Add the squash and cook to until it starts to soften. Using a slotted spoon, add the browned sausage to the cooked vegetables and remove from heat. 4. In a bowl beat the egg whites until frothy. Take the peppers from the oven and leaving them on the sheet, stuff them with the sausage and squash mixture. Spoon the egg whites over the peppers to fill in the gaps. 5. 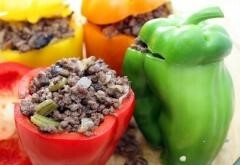 Return the filled peppers to the oven and roast for about ten minutes or until egg whites have cooked completely.